The concept and stated goals of disability insurance are commendable. Unfortunately, the way some disability insurance companies handle claims made by their disability policyholders is contemptible. A disability insurance policy is intended to protect against one of the greatest threats to your financial security: becoming unable to work due to a disabling injury or condition. If you are unable to work because of a physical or mental disability, your income will be drastically reduced or eliminated entirely, while your expenses will remain the same or, in many cases, those expenses can even increase. The purpose of disability insurance is to provide income to pay the expenses of life even though you are unable to work due to a disability. Without disability benefits, your family could be at risk of missing rent or mortgage payments, falling behind on bills and utility payments, and not being able to afford food, medicine, and other necessities of life. It is truly at times of crisis, such as the onset of a disability, that consumers need their insurance to come through for them more than ever. Disability insurance may be something you obtained through your employment (group long-term disability), but it may also be something you purchased separately, either as part of your life insurance, an umbrella policy, or as a stand-alone insurance product (private disability insurance). As with other insurance policies, at its core disability insurance is a contract: obligating your insurance company to pay benefits when you become disabled. Disability insurance generally covers you through a period of illness or injury when you cannot work, regardless of whether the illness or injury itself is work-related. Los Angeles insurance attorney, Eduardo A. Brito, is there to help you when your insurance company fails to abide by its obligation to pay your disability insurance claim. Insurers have devised various ways to justify the denial of disability insurance claims. Some hire investigators to follow and videotape you in order to challenge your disability claim. 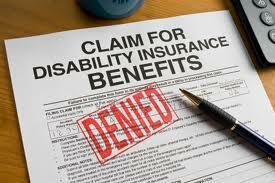 Your disability insurance company may simply deny that you are disabled at all or it will challenge the extent of your disability. It may also claim that the incident which caused your injury or illness was not covered under the policy or that your inability to continue working in your occupation (or any occupation) is due to extraneous factors other than your true disability. One common tactic used by insurance companies is to make only partial payment that does not fully compensate you under the policy thereby rendering you economically vulnerable and, therefore, less willing or able to challenge the insurance company’s unfair treatment. Aware that the denial of claims means more profit and that many policyholders simply do not have the means or the will to challenge their actions, some insurance carriers would rather risk lawsuits than pay all the benefits which policyholders are entitled to receive. Contact the Law Office of Eduardo A. Brito for a free initial consultation regarding your disability insurance situation. You can reach us by telephone at (626) 463-7076 or by e-mail. An evening appointment is available upon request, as is a home or hospital visit if your illness, injury or disability prohibits you from traveling to our Pasadena office.